FORECASTERS are closely monitoring a low pressure system in the Coral Sea which could develop into a cyclone off the coast of Queensland, bringing strong winds and big waves to the southeast. The system, which is currently sitting around the Solomon Islands, is due to move south over the next few days, with the Bureau of Meteorology predicting a 20 to 50 per cent chance of a cyclone developing on Tuesday. Forecaster Rick Threlfall said, however, by the time it moves close to the coast on Thursday it's unlikely to be cyclonic, but could bring big waves and strong winds across the southeast corner of the statae. Mr Threlfall said it was too early to pinpoint where the system will land, and if the waves will be as big as the king tide which hit the region last month. Meanwhile, the mammoth recovery in the flood-stricken north could take weeks with floodwater receding at an excruciatingly slow pace. 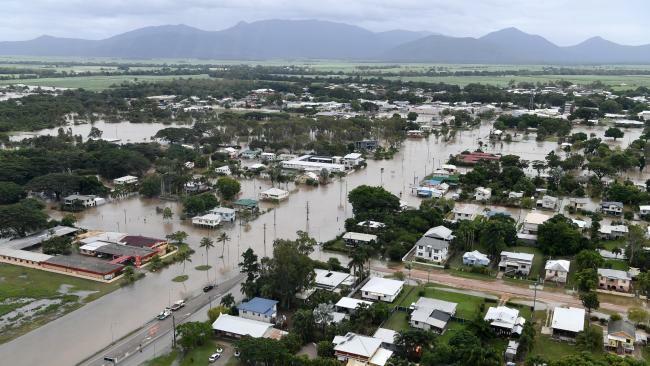 The Insurance Council of Australia has declared the widespread flooding a "catastrophe", which means insurers will work to prioritise customers impacted by the flooding. About 20 schools and preschools will remain closed on Monday with hundreds of properties inundated and several rural communities isolated by swollen rivers. Hinchinbrook mayor Ramon Jayo said it would be some time before the cost of the disaster was known. "It certainly won't be cheap," Cr Jayo said. "The river has started receding but it's very slow because there's still a lot of water in the upper reaches which still needs to come down. The (water) levels in the lower Herbert haven't dropped an inch all day." Cr Jayo said while it had been a "full on" experience, residents were in high spirits and ready for the clean-up. "They've been through it all before so we just need the water to drop and we can get stuck in," he said. While many towns were hard-hit, Townsville came through relatively unscathed, having received only 24mm of rain over the past week. Weather bureau forecaster David Crock said the worst of the rain appeared to have now passed for north Queensland. Premier Anastacia Palaszczuk on Sunday flew to Ingham where 90 per cent of properties have been hit. "I don't think the people in the southeast realise how much impact this flood has had on this region and the surrounding communities," she said. "It's great to see how resilient this community is, they've seen it before, they know what to do and I've been absolutely overwhelmed by their positive attitude." Queensland Police Service Deputy Commissioner Bob Gee said the resilience of north Queenslanders in the face up such adversity was "astounding". "It's great that, particularly in Ingham, preparation and common sense, people thinking before they act has worked for us," he said. "But we still have half the town split, the highway cut off, so road safety, thinking about the water you're using, those basics are really important. "Just stay prepared as we don't know what the weather will do over the coming three to four weeks."